Two pocket shop ticket holders keep important project and job information together in one convenient place. Read about shop ticket holders. Two pocket shop ticket holders keep important project and job information together in one convenient place. Large 9 x 12 pocket holds papers, catalogs, schedules, lists and more. Small 9 x 6 pocket holds CDs, keys, notes, and all other corresponding job information. Convenient strap and eyelet at top for hanging. Reinforced black stitched edge for longer product life. 15/BX. Learn about the wide variety of shop ticket holders at C-Line..
Shop Ticket Holder Special Features: Strap, dual pockets plus extra large hanging grommet. Suggested Use: Two pockets allow for multiple items to be stored and organized for increased accessibility. Hi, I'm Griffin at C-Line. And today we're going to talk about our Two-Pocket Shop Ticket Holders with Hanging Strap. These Two-Pocket Shop Ticket Holders keep important project and job information together in one convenient place. 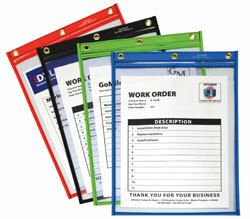 The large 9 x 12 pocket holds work orders, papers, manuals, and more. The smaller 9 x 6 pocket holds keys, notes, CD's, and other corresponding information. The holders are manufactured from heavyweight rigid plastic with taped and stitch edges to provide matching durability for your documents. Clear on both sides, the holders have a hanging strap and oversized metal eyelet, making it easy to hang your job ticket with your job, whether it be on a car, piece of machinery, in the office, or wherever you need it. Two-Pocket Hanging Shop Ticket Holders are perfect for auto repair shops where the work order and keys can be hung right on the vehicle. They also work in manufacturing, office, retail, and shop environments -- really anywhere information needs to be posted and easily accessible. Order yours now! That's all we have for today. I'm Griffin at C-Line, and thanks for watching.